We went systematically, first doing a quick walk around to survey our options and then decide what we wanted to have the most. We ended up getting in line to get oysters, as it the entire event revolved around them and the line up for them just seemed to be getting longer and longer. Better wait a while and eat them earlier than risk them running out and not having any later! Trading four tickets for ten oysters, we slurped them down in 1/5 of the time that we spent waiting in line. So delicious! I can’t tell you how much I love oysters… All kinds. After that we went from stand to stand, tasting a little bit of everything. Things that stuck out to me were Brit & Chips’ haddock in maple syrup batter on top of fries, doused with malt vinegar. The sweet syrupy taste was there, but not overpowering at all. L’Original’s surf and turf made of lobster and wild boar stuffed between a bread bun was also very delicious as the mix between fish and meat gave way to a particularly unique taste. Venti’s offering was a gigantic circular tablet made of a sort of thick pizza crust. Inside, the stuffing was of pasta, a variety of sausages and was finally topped with freshly grated cheese. Phew! It was a bit too much for me, especially as I wanted to try a few other dishes but nonetheless a very hearty and comforting dish I could see eating as a main. Another interesting concoction was AIX’s liquid nitrogen strawberry ice cream. So interesting to see it happen live – I’ve only ever seen it performed on television (cue Richard Blaise on Top Chef). Great job to the organizers of the event! I can’t wait to go back next year. Tags: AIX, Brit & Chips, Burgundy Lion, Fish and Chips, Haddock, Ice Cream, L'Originale, Liquid Nitrogen, Lobster, Malt Vinegar, Montreal, Oysterfest, Oysters, Strawberry, Surf and Turf, Venti, Vieux-Port, Wild Boar. 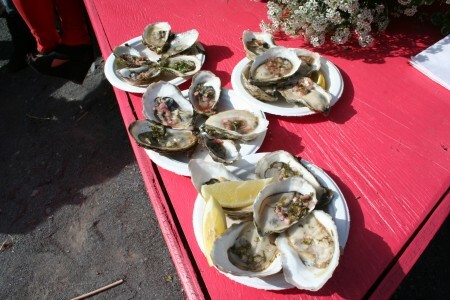 You are so lucky to have been able to attend Oysterfest. I would love to live close enough to go… maybe this year! Such a great event. We can't wait for the next one! If you end up going this year, let us know about your experience in the comments!